Last week, very few people had probably heard of Khader Adnan, I’ll admit myself included. The Palestinian prisoner was on hunger strike for over two months, when efforts by Twitter users brought his story into the spotlight via Twitter’s trending topics. Accused of being a member of the Islamic Jihad, Palestinian prisoner Khader Adnan was detained, without any charges brought against him. He was not tried, and up until yesterday, did not know how long it would be before he was released. All of that has changed, with the announcement that Adnan will be released by mid-April, and that he has ended his 66-day hunger-strike. Adnan’s story was all but ignored by mainstream media, until a group of online activists decided to take to Twitter to bring it some much-needed attention. 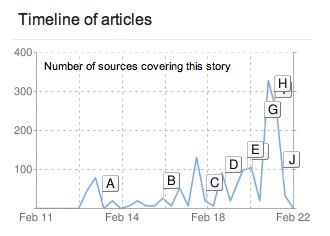 A search on Google News shows the story getting no attention whatsoever at the beginning of February, and peaking to over 300 sources at the height of the campaign. The online protest took the form of a hashtag a day, with the aim of making that hashtag trend. The prisoner’s name, #KhaderAdnan, was the main hashtag used in the online campaign, along with various phrases that changed on a daily basis. The hashtags included #respect4khader, #dying2live and #HungerStrikingfor65Days, all of which were used in an effort to publicize Adnan’s story. The campaign achieved its goal with the hashtag #KhaderAdnan making its way into the trending topics a couple of days ago, and has been tweeted over 54,000 times up until now. Celebrating the fact that his release had been announced, Twitter users were once again able to bring Khader Adnan into the trending topics with the hashtag, #KhadersVictoryforPalestine. “Because of the lack of coverage on Palestine in mainstream news, a lot of activists indulge in social media sites like Twitter in order to find information. A lot of unnoticed stories usually end up online from activists, or citizen journalists if you will, who are on the ground in Palestine. This is very vital for cyber activists like us. Leila, together with Palestinian Twitter user @sshusma, chose the hashtag, #Dying2Live, and set about, with the help of other activists, seeing to it that it became a trending topic. By then the group had major media outlets including Al Jazeera, BBC and CNN reporting Adnan’s story, while the momentum was taken offline as well, with protests outside Adnan’s hospital. This is not the first time we’ve seen Twitter being used in the region as a tool of online protest or to raise awareness. In October, Egyptian activists began tweeting about Maikel Nabil, Egypt’s first blogger to receive a prison sentence following the uprising last year, as a way of bringing attention to his cause. Nabil, who was on hunger strike for four months, and has since been released. Khader Adnan’s story shows that, Twitter’s trending topics, while more often overrun by Lady Gaga or Justin Bieber fans or swept into one meaningless Internet meme after the other, have a real role to play in the activist’s arsenal of tools. At The Next Web, we’ve written at length about Twitter’s role in journalism, and how it has affected and changed the mainstream media landscape, both in positive and negative ways. Our own Paul Sawers wrote about the impact social media has had on journalism, and how while social media is usually first to a story, readers wait for confirmation from reliable mainstream media sources. In the case of Khader Adnan, there was a clear role reversal, with Twitter users leading the way, and mainstream media following their trail.